Using Red Metallic Shimmer Sheetz cut 1 set of Fitted Frames 1- Lacy Rectangles. Using 100 lb Soft Finish Cardstock with Double Sided Clear Adhesive on both sides cut 1 set of Fitted Frames 1 – Lacy Rectangles. Remove protective paper from front of white fitted frames and add Cool Diamond Silk Microfine Glitter and burnish in using your fingers. 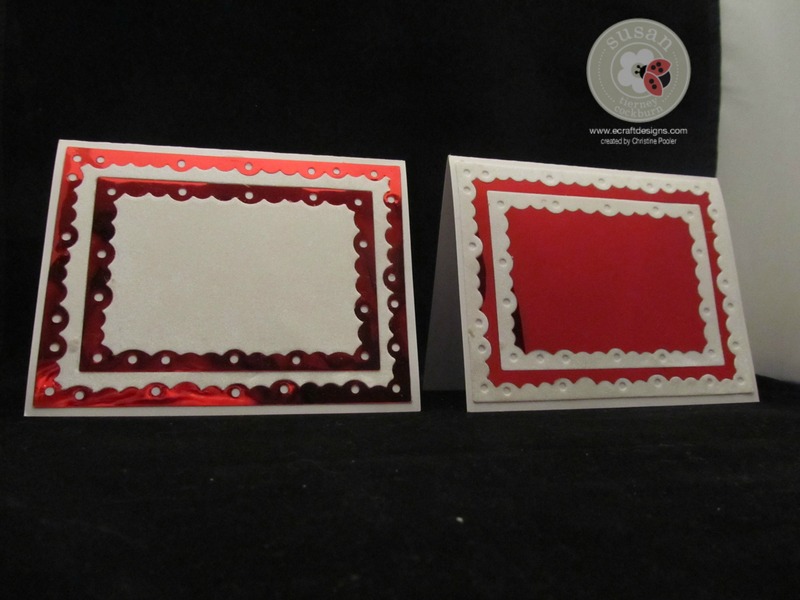 Take an A2 (4-1/4 X 5-1/2) card base and alternating between the red Shimmer Sheetz orange shade and the glittered white frames add them to the front of the card base ( I actually do 2 card bases at the same time). Using white, green and yellow cardstock cut out 3 poinsettias and shade, shape and assemble using Susan’s video tutorial seen here as a guide. Using White Pine Boughs and Pinecone die and cut several pine boughs from green cardstock. Shade a little with PanPastels set 3 orange shade. Pinch with fingers to give dimension. Add poinsettias, leaves and pine boughs to center of card using clear drying glue. The second card was finished off by turning it so it is a top fold card and adding the poinsettias, leaves and pine boughs to upper left corner. Cut Noel from 100 lb cardstock with double sided adhesive on both sides (this may take several passes through diecut machine due to thickness). Remove paper from top and add glitter. Attach to lower right corner. Add red gems around card where the holes are. Finally dab clear drying glue to different areas of the flowers, leaves and boughs then add diamond dust. Hope you will make some of these cards – change it up a little using a different color Shimmer Sheetz and Poinsettias. Until next time Happy Scrapping!! What a beautiful card!! Absolutely stunning!